Capnography is the process of monitoring partial pressure or concentration of carbon dioxide in respiratory gases by using capnogram. It is majorly used as a monitoring tool during intensive care and anesthesia. Capnography helps to anesthesiologists to prevent the hypoxia and help to determine the situations that can lead to hypoxia and may cause irreversible brain damage. Due to these advantages, capnography is widely used in endoscopic suites, emergency rooms, x-ray rooms, and on-site emergency and trauma centers. In healthy individuals, difference between the arterial blood and expired CO2 partial pressure is very small however, in presence of lung disease, and some congenital heart disease the difference is increased and can exceed 1 kPa. Increase in the prevalence of respiratory diseases such as COPD and asthma in Europe region mainly in UK, France, Germany, Italy, Spain, and Switzerland, technological advancements in the capnography devices, and recommendations by European Resuscitation Council (ERC), Association of Anaesthetists of the Great Britain & Ireland (AAGBI), and Intensive care Society in U.K. for the using of capnography devices are anticipated to fuel the capnography devices market. However, alternative devices availability for capnography such as pulse oximeter, new clinical studies restraining the usage in non-intubated individuals, and issues associated with capnography usage are impede the growth of capnography devices market. Geographically, Europe capnography devices market is segmented into Germany, France, Italy, Spain, Russia, Poland, UK, and Rest of Europe. Germany capnography devices market is growing due to increase in the prevalence of COPD (approximately 6,155 cases observed per 100,000 people), increase in the R&D activities for the innovation of newer products, and expansion of business by market players are propel the market. France capnography devices market is projected to grow at a significant rate, which is attributed to rise in prevalence of COPD and other respiratory diseases (according to European COPD Coalition, 3.5 Mn COPD cases were present and approximately 16,000 people die every year), and mandatory usage of capnography devices in anesthesia conditions are expected to boost the market. 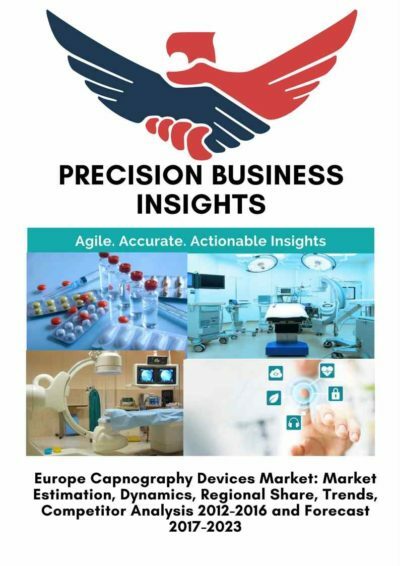 U.K capnography devices market driven by increase in geriatric population and change in lifestyle, rise in focus on the development of newer devices by market players, and product approval and launchings are propel the market over forecast years in the country.